In today's digital world, where global boundaries can be bridged in an instant, strong communication skills have never been more important. Experience Communication teaches the fundamentals of successful communication in an increasingly digital and global environment, and motivates students to confidently use digital tools and social media to represent themselves effectively in person and online. 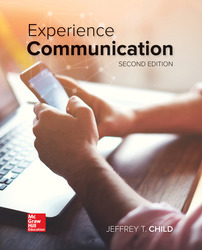 Written for today’s digital native student, Experience Communication reflects how pervasive the mediated aspect of communication impacts our lives. How Are Verbal and Nonverbal Communication Related? Why Are Nonverbal Codes Difficult to Interpret? How Can You Improve Your Nonverbal Communication? Why Care About Delivery Skills? What Is Your Immediate Purpose? Why Should You Try to Persuade? What Is the Difference Between Evidence and Proof? How Can You Test Evidence?